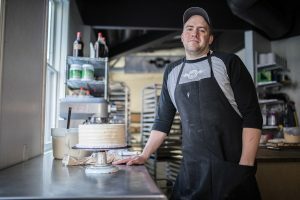 It wasn’t luck but pluck—and lots of late nights—that turned self-taught baker Pete Tidwell into a successful businessman and two-time winner of Cake Wars, including a 2017 victory against other past winners. Photo by Bradley Slade. A cranberry cake with blue-cheese frosting? This unconventional pairing—styled even less conventionally as a villain from the video game Halo—got Peter L. Tidwell (BA ’11) and his assistant through the first round of Food Network’s Cake Wars last summer. Another Halo-themed creation—a chocolate brownie pound cake with a vanilla Italian buttercream frosting—sealed the win, earning $10,000 and acclaim in the baking world for Tidwell, owner of Provo-based bakery The Mighty Baker. Not bad for a guy who studied advertising in college. That 2016 win whet his appetite for more, and in 2017, Tidwell returned to Cake Wars and won a second competition—this time beating out other past champions. Solid technique and passion are a good combination. Even as Tidwell studied advertising at BYU, his longtime love for cooking drew him to the kitchen and to his television, and especially to baking shows like Cake Wars. “I was really intrigued and just wowed by some of the amazing things that those pastry chefs did on those shows with cake,” says Tidwell. Inspired, in between classes and home- work, Tidwell would dedicate time to learning the tricks and secrets of making sweet treats. 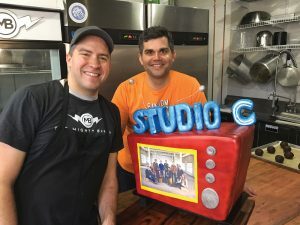 Pete Tidwell (left) loves creating an ambitious cake, like this entirely edible Studio C–themed work of art. 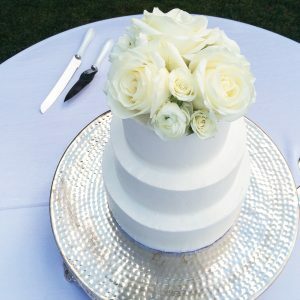 He donated this cake in an episode of BYUtv's new show, Random Acts, as a way to pay it forward to a deserving family. Photo courtesy Pete Tidwell. Tidwell got more exposure to the baking world in 2010, when he traveled to New York City to work as an advertising intern for L’Oreal. In his free time, and later as he worked as a full-time employee for L’Oreal and Microsoft Advertising, he’d visit bakeries and study textbooks he found at a New York culinary school. “Through those couple years when I was in New York, going to some of the most amazing bakeries in the United States and just tasting these amazing things and trying to make them at home, I learned that I had a natural talent,” he says. He had talent but not a full kitchen. A door opened when his parents left to serve a full-time mission and offered their home to Tidwell and his wife, Charlotte McKinlay Tidwell (BA ’07). Finally equipped with a full kitchen, Tidwell began to bake. While working full-time in a marketing position, Tidwell poured all of his free time into making his bakery dream a reality. “I would be up late at night, nights and weekends, making wedding cakes, preparing for farmer’s markets on Fridays, and basically testing the market with our products,” he says. As word of mouth spread, Tidwell outgrew his parents’ kitchen and took the leap, quitting his day job and opening The Mighty Baker in Provo, south of BYU campus. Wedding cakes were one way Pete Tidwell earned his baking chops. Photo courtesy Pete Tidwell. 1. Cut parchment paper to fit the bottom of the baking pan. Place paper in pan. 2. Coat sides of pan with cooking spray. 3. Pour batter in pan and bake. 4. Remove when the time is finished or when a toothpick comes out clean. 5. Let cake cool to room temperature. 6. Place cake in a freezer for one to four hours. 7. Tap pan to loosen cake onto workspace.